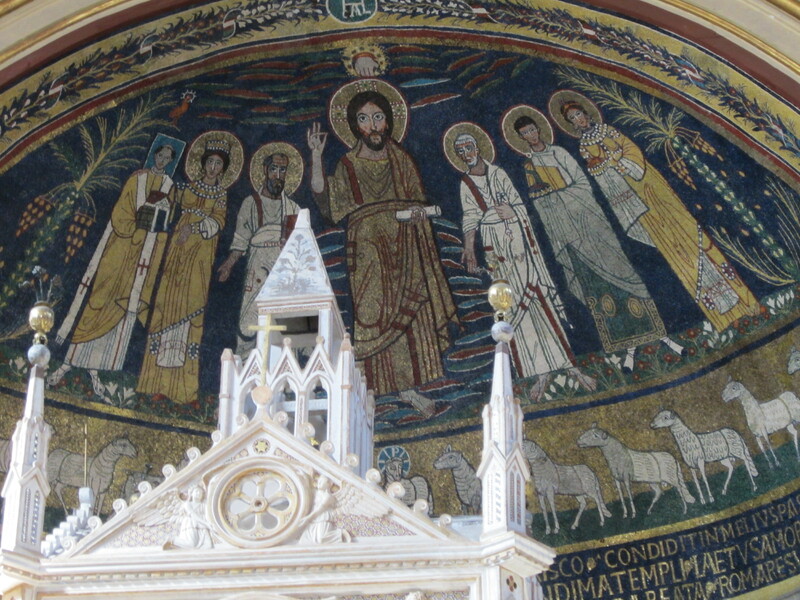 My blogs for the next week will feature some of the churches I am visiting on a pilgrimage to Rome. 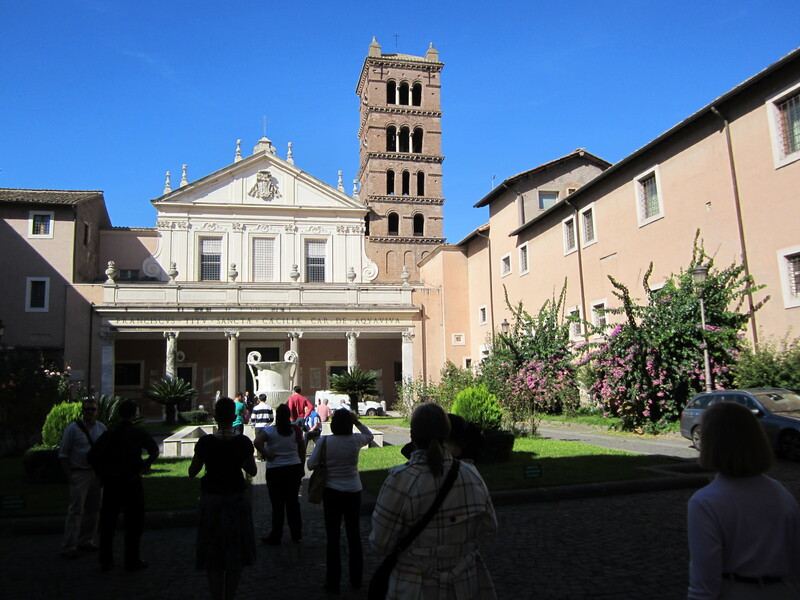 Today we visited two churches in district of Trastevere, the Basilica of Santa Maria and St. Cecilia Church. In the first century Trastevere was a Jewish area of Rome. 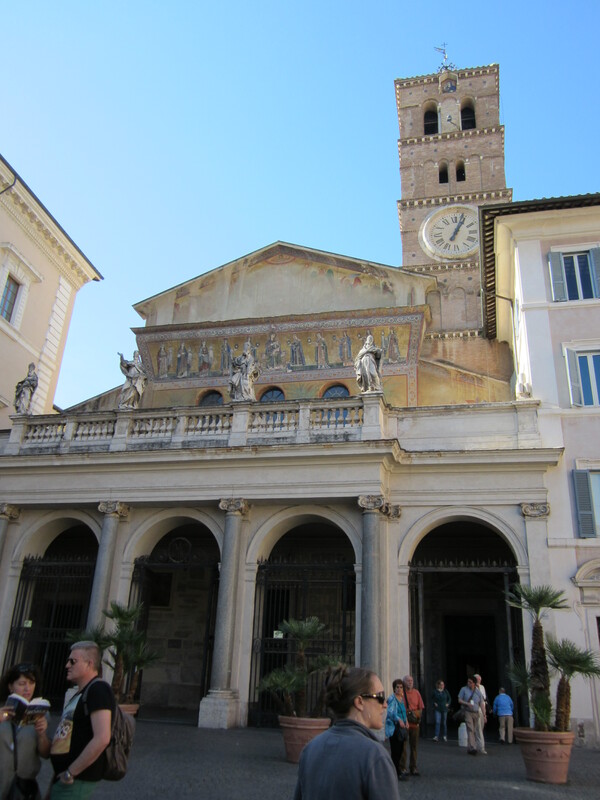 It is believed that Trastevere is were saints Peter and Paul preached in the synagogues of Rome. 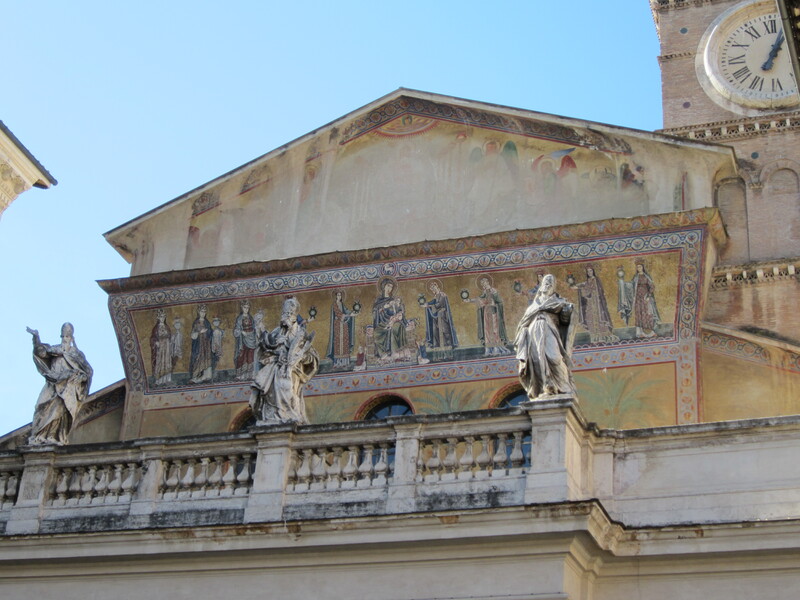 Both The Basilica of Santa Maria and St. Cecilia Church were originally house churches. St. Cecilia was martyred in her home. In honor of her martyrdom a church was built on the site of her home. The Basilica of Santa Maria is believed to one of the oldest churches in Rome and perhaps the first church in Rome were the mass was openly celebrated. We celebrated mass at the Basilica. 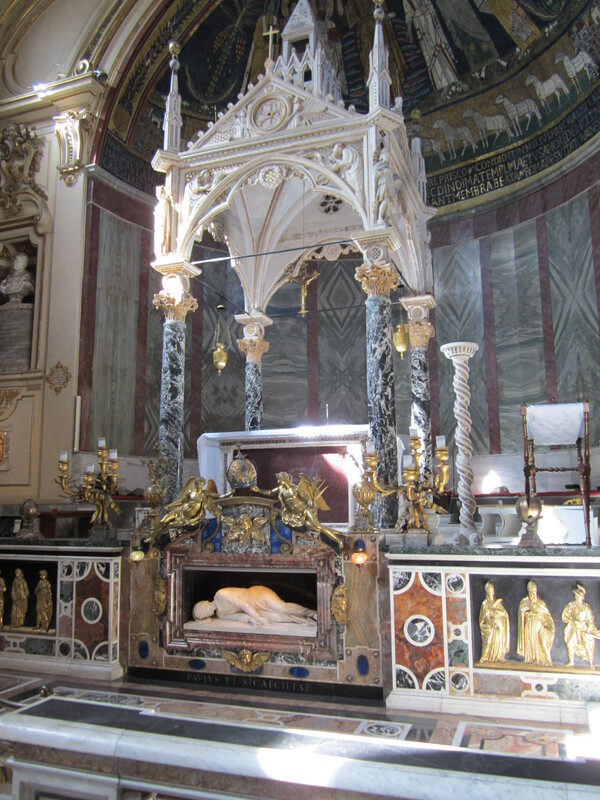 Below the altar is statue made of St. Cecilia’s body. The mold was made from her body that was exhumed 500 years after her martyrdom. The canopy above the altar represents the tent where God dwelled with His people prior to the building of the Temple. Circular halos are for deceased saints, while square halos are holy people who are still living. 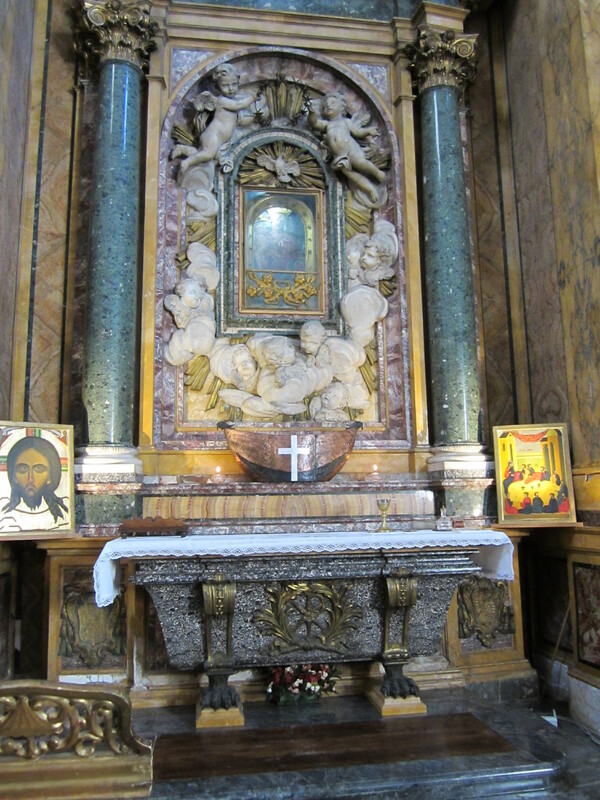 Side altar where we had mass at the Basilica of Santa Maria. 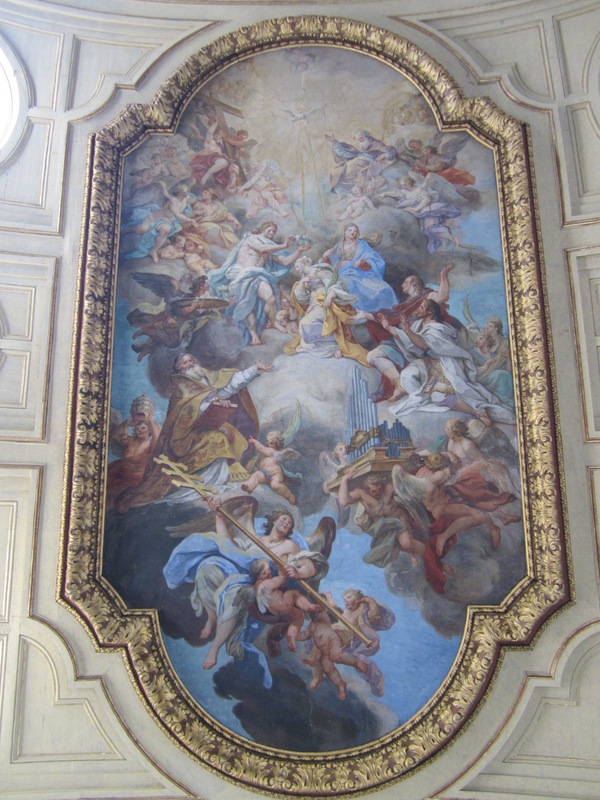 This entry was posted in Essays, Pilgrimage and tagged Basilica of Santa Maria, Catholic, Catholicism, Christian., Christianity, Jewish area of Rome, Pilgrimage, Rome, Saints Peter and Paul, St. Cecilia Church, Trastevere. Bookmark the permalink. Enjoy your visit. Hope you visit the catacombs as you will see St Cecilia there as well. Love, love, love Rome. Touring Roman churches works up an appetite. Good thing there is plenty of calzone nearby 😉 Enjoy your pilgrimage, Michael. God bless! Thank you Saintly Sages, And, may I add a thirst for good wine. Thank you, I have been remembering all who read my postings in my prayers. Seeker, Thank you. We had a blessed Pilgrimage, all who I follow and who follow me were in my prayers.